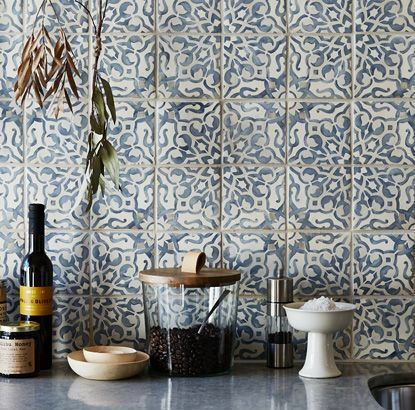 Walker Zanger reimagines its highly popular Duquesa collection by now offering its most beloved tile designs in cement. Spanish for “duchess,” the Duquesa™ Cement collection adds the durable nature of cement to four timeless patterns—Alba, Fatima, Fez and Jasmine—for a broader range of application options that enrich the aesthetic of any space. The Duquesa Cement collection features four pattern options—Fatima, Jasmine, Fez and Alba—each in the color Mezzanote. Shown: Jasmine in Mezzanotte. The pattern Fatima draws inspiration from Italian textiles of the 16th century, Portuguese ceramic tiles and Moorish mosaics. Fez fuses influences from Spanish and Egyptian wood inlays, exotic pendant lanterns and Chinese decorative screens. Lastly, Alba celebrates Moorish geometric designs and bronze metalwork, while Jasmine takes on the curvaceous look of Moroccan arched doorways and carvings. 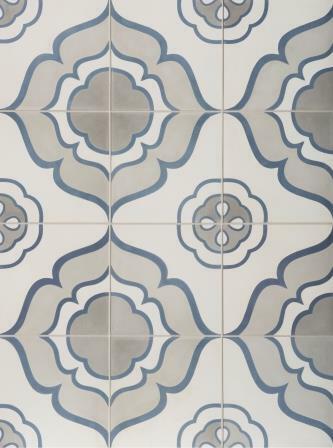 All Duquesa Cement tiles are featured in Walker Zanger’s exclusive color Mezzanotte (meaning “midnight” in Italian), which represents a dusty-blue night sky in contrast to a light gray and creamy white background. Each tile profile creates a vintage mood with a modern twist that resides comfortably in a home with historic roots, or brings juxtaposition and character to a contemporary space. Offered in 8-by-8-inch dimensions, each tile is handcrafted using cookie cutter-like open pour molds. Pigmented cement is poured into the mold, topped off with powdered cement and compacted by a hydraulic press to produce ornate designs on the tile’s surface. This technique results in clean, precise lines and dramatic pops of color that add a bold design element to both residential and commercial projects. Explore the inspiration and designs of Duquesa Cement by visiting Walker Zanger’s Pinterest board here: http://bit.ly/WZ_DuquesaPin.